« Is your digital transformation strategy prepared for IoT? 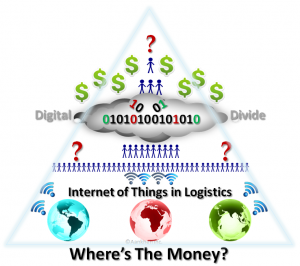 In my previous post about using IoT in logistics (IoTiL), the top three “where’s the money” opportunities mentioned were: e-commerce, the food chain and third-party information logistics. In the spirit of using IoT for good, here are some examples of opportunities in the agri-food supply chain that benefit a large population. The food chain is part of the $8 trillion agriculture industry. About 1.4 billion people (20% of the 7+ billion world population) work in agriculture. Making a difference can benefit 7+ billion people. IoT in logistics is deployed at the ground level (bottom of the pyramid) where the majority of the workforce is employed. A growing digital divide exists between executives and the workers at the bottom of the pyramid. The view from a 30,000-foot level is different. Do executives get information or fake KPIs? Are IoT investments disappearing in the clouds? To successfully monetize IoT, deployments must address what’s in it for the worker. Executives who address the needs of the workers will reap the benefits of IoT for their organizations. What’s IoT got to do with the agri ecosystem? Agriculture is a global business. Bananas can come from Philippines, Africa, South/Latin America. Coffee, sugar, cocoa, fruits, vegetables and roses for Valentine’s Day come from all over the world. Global sourcing makes year-round availability of fresh produce possible with supply chain and cold chain logistics. With reference to McKinsey & Company’s article on food wastage, in emerging economies, 32% of total loss occurs during production. In developed economies 38% of loss occurs during consumption. Agri inputs can represent 60% of the cost of goods sold. Every process, system and resource used in the agri ecosystem can be improved significantly. The resources used in the agri ecosystem include farmlands, equipment (tractors, trucks, harvesters, containers, chassis, reefers, gensets), materials (fertilizers, pesticides, seeds), warehouses, cold storage, processing facilities (machinery), packaging (boxes, containers) and people (farmers, farm labor, equipment operators, mechanics, truck drivers, managers, mill owners, bankers, insurance). Using IoT in logistics increases the efficiency and utilization of physical and financial resources in the production and distribution of product. 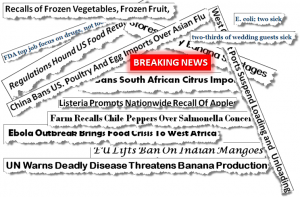 Recalls are a daily occurrence in the food chain and one of many examples of food wastage. About 48 million people in the U.S. get sick every year from eating contaminated food. Food safety is a concern for all. Contamination can be introduced at any stage in the supply chain from farm to consumer. Visibility, traceability and security are essential for maintaining the integrity of the food chain. Farms: How can you have end-to-end visibility when you don’t know where the farm is? Distribution of agri-inputs (fertilizer, pesticides, seeds): Did the inputs go to your farms? Harvesting: What is the utilization of equipment? Is the equipment efficient? Transportation of harvest: Is your harvest being diverted? Are temperature and humidity controlled? Processing inputs: Where are the inputs coming from? Storage: Where is the product stored? Finished goods distribution/export/import: Is your product reaching the customer securely? The sugar industry faces worldwide cost competition. The industry, like many in the agriculture sector, relies on government subsidies to survive. However, the industry is also burdened with inefficiencies that can be reduced significantly. 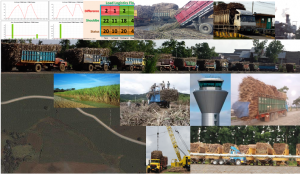 A sugar cane farmer requires several resources to get sugar cane from the farm to a sugar mill. These include labor for harvesting, equipment to load the harvest, trucks to haul the load to a mill or transloading station. Cranes transfer the loads onto chassis at transloading stations and trucks haul the loaded chassis to a mill. Drivers, mechanics and support personnel service the equipment used. The process is labor intensive. Trucks, chassis and equipment break down frequently. Once the load is in transit to a mill, when the truck will return for the next load is unknown. The farm labor can idle or continue harvesting and risk the quality of harvest losing value with time. The familiar sight of long queues of trucks waiting at sugar mills is a glimpse of the inefficiencies that exist. Idling drivers and equipment waiting for the loads to be processed add to uncertainty and additional costs per tonne of sugar produced. There are many variables in the dysfunctional process. Decisions are made by stakeholders with only their interests in mind. The mill wants to maximize its capacity and output. Farmers want to maximize their revenue. The drivers and labor want to get paid for waiting. These decisions create conflicts, inefficiencies and higher costs resulting in a lose-lose proposition for all. Using IoT data with process automation and a virtual control tower, wait times are reduced, drivers make more trips, utilization of equipment and farm labor improves, and costs are reduced for all. With a virtual control tower you could be in Singapore, San Francisco or Geneva and have visibility to your global supply chain operations. That is digital transformation with no pain. 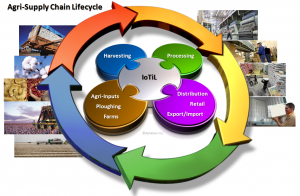 The example provided is illustrative of a use of internet of things in logistics to deliver cost efficient and affordable solutions in the agri-food chain industry. Similar inefficient processes repeat for various produce every cycle in many countries. Global food company executives investing in digital transformation should consider IoT in their initiatives. IoT now provides the ability to subscribe to visibility as a service when required and where required on demand at a fraction of the cost. That means a repeatable, common process with visibility across your global supply chain as a service with no waiting for years. Look for IoT solutions as a service that deliver what you want on first use instead of promises. Yes, it is possible today to make a big difference. In the next post I will address a use case for IoTiL in e-commerce. I look forward to your comments.